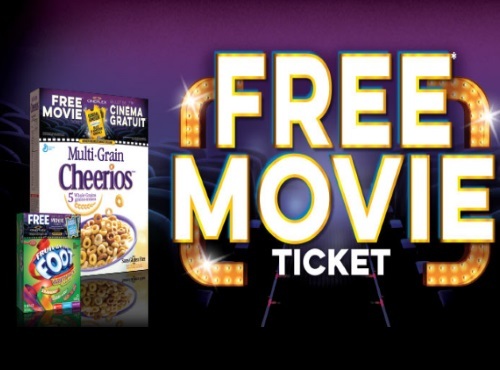 Cineplex Odeon has partnered with General Mills for a Free Movie Ticket offer! Get a Free Movie Ticket offer on specially marked General Mills products (Cereal, Child Snacks, Oatmeal Bars, Hamburger Helper). Voucher codes are valid for use from October 2, 2016 - January 31, 2017. You can start redeeming the codes on October 2, 2016. While supplies last. Offer has no cash value. Offer available for Canadian addresses only. All offers are applicable for Sunday through Thursday admission only. Promotion ends January 31, 2017. While supplies last. Offer has no cash value. Offer available for Canadian addresses only. All offers are applicable for Sunday through Thursday admission only. Promotion ends January 31, 2017.